Maffra, a rural town in East Gippsland, is 180 km east of Melbourne and 20 km north of Sale. It is on the Macalister River, which is dammed upstream at Lake Glenmaggie, and is the centre for a large irrigated dairy industry. Maffra was part of the Boisdale pastoral run taken up by Angus McMillan, on behalf of Lachlan Macalister in 1840. McMillan had the Bushy Park run to the east, separated from Boisdale by the Avon River. Stratford, on the Avon River, was settled (1854), and in 1862 the Stratford community built a punt across the Macalister River for carrying supplies to the goldfields at Crooked River and elsewhere in Gippsland. In 1863 the Avon road district board had a town surveyed at the crossing, and the town was named Maffra. It is thought that the name came from a Maffra pastoral run on the Monaro tableland, New South Wales, itself named after Mafra, Portugal. Both men were from Monaro. Maffra is in a rain-shadow area and many of the early farmers grew fodder crops and cereals. A flour mill opened in 1866. Scottish farmers, who settled there in above-average numbers, built a Sunday school hall for Presbyterian services in 1866. By then the town also had a hotel, two stores, a bakery and a post office. Nearby Newry gained a Presbyterian church in 1867. Maffra’s Anglican and Catholic communities built their churches in the 1870s. In 1875 Maffra shire was severed from Avon shire. The shire was headquartered at Maffra which since 1873 had been the appointed place for Avon council meetings in a new shire hall. The river flats around Maffra were good cropping land. Further north there was extensive cattle grazing and around Heyfield there was timber harvesting. Several towns had timber mills. 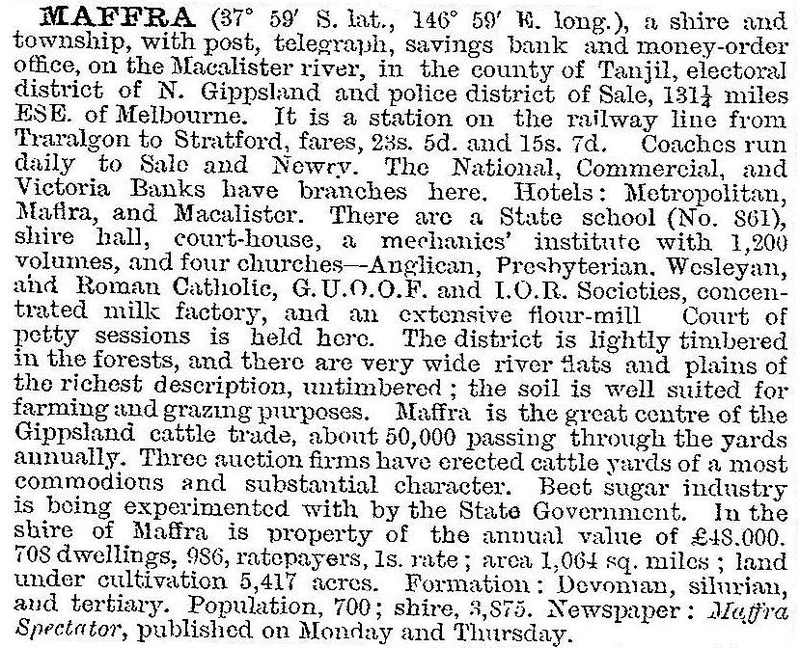 The Victorian municipal directory (1885) stated that Maffra was the clearing house for East Gippsland cattle, with five auctioneers working the saleyards. Newry, 10 km west of Maffra, was characterised as the granary of Gippsland. So important was the region that in 1883 and 1887 a railway line was built from Traralgon to Heyfield and from Heyfield to Stratford via Maffra. It came less than a decade since the Gippsland line had opened between Traralgon and Stratford. A branch line to Briagolong opened in 1889. In 1897 beet sugar was first grown around Maffra. The era of intensive cropping was yet to come. Irrigation was considered at Newry in 1905, but not until after World War I did it successfully emerge. The State Rivers and Water Supply Commission began building supply channels in the early 1920s and the Glenmaggie weir was operating by 1925. Both beet growing and dairying on irrigated pastures were boosted, although the better-paying dairying and opposition from Queensland sugar interests put beet sugar out of business by the late 1940s. Maffra had a large beet-processing factory, and when it was demolished many of the bricks were recycled into farmers’ dairy yards. Maffra had three dairy factories: a branch of a Bacchus Marsh company (1921) which was taken over by Nestle; the Willsmere Dairy Company (1922) and the Maffra Co-operative (1918), known as Maffco. Takeovers and amalgamations have resulted in a single Murray-Goulburn factory. Maffra Co-operative joined Bairnsdale and Orbost in 1966 to become Gippsland Consolidated Milk Limited, and Gippsland Consolidated merged with Murray Goulburn in 1973. In addition to the factory Maffra had a dairy herd-testing unit (1925) and an artificial breeding centre (1956). The railway line to Briagolong closed in 1952 and the line from Traralgon to Maffra closed in 1987. Maffra’s main thoroughfare is Johnson Street, a block away from the former railway line. The sugar beet factory was further away, between the railway and the Macalister River. Johnson Street has a tree-lined median and a number of surviving heritage buildings. Foremost are the former National Bank (1877) and court house (1888). Other notable buildings are the Maffra and Metropolitan hotels, Fosters buildings (shops), the RSL hall and the World War I memorial hall. The World War II memorial hall is in Foster Street. Church Street has the Anglican church (1900) with impressive windows and a lychgate, a former Methodist church and the State primary school (1871). The former Presbyterian church (now Uniting) was built for a large congregation. The Catholic church adjoins its primary school (1905) and at the other end of the town there is the State secondary college (1955). The college began as a higher elementary school in 1924. The hospital (1946) is at the north of Maffra. In 2014 the primary school had 276 pupils and the secondary college 635 pupils. There are a bowls club (1921), a golf course (1950), several recreation reserves and the Agricultural Pastoral and Horticultural Society’s showgrounds (1888). At the 2011 census, dairy farming accounted for 4.5% of employment in Maffra and environs, dairy manufacturing 3.5% and education 7.7%.